Five young people from SOS Children's Village Bogotá are getting ready to start a new phase in their lives. To share with other youths, to get to know oneself, and to reflect on one's future will surely be part of the new tasks waiting for them at their new homes. 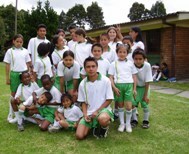 Rocio, Fabian, Sergio, Oviedo, and Giovanni are five teens who are currently living at SOS Children's Village Bogotá. These young people are preparing for one of the most important steps in their lives: the achievement of being able to lead an independent life. This is for young boys and girls ages 16 or over who have made considerable progress in personal development during their time with an SOS family and, thus, are ready to live at an SOS Youth Facility. At SOS Children's Village Bogotá, there are several young boys and girls who are getting ready for leading an independent life. This is why five facilities to take in about 25 young people (two for boys and three for girls) have been projected for 2007. "I was welcomed to the organization when I was five," Rocio remembers. "I was lucky to rely on a family where I found a lot of love and support. ... I grew up together with my brothers and sisters ... some of them are attending university [...] This year, I'll finish high school, and my goal is to continue studying [...] and now that I finished the "first stage" (living at the village), I am prepared to experience life in a youth community. What I want is to work, to find a job and define the way my career is going." Similarly, Sergio comments: "I arrived at the village over ten years ago. My mother died and my relatives were unable to take care of me, so they came across SOS Children's Villages and ... well... here I am." "At the beginning, I did not feel very well because I was unable to overcome losing my mother. But as time passed, I started to see things in a different way. Today, I feel fortunate for being part of this great organization. I feel very grateful for their support [...] and I will continue making the most of this support." When asked about the youth facility, he says: "I think that it will be very special. At the youth facility I expect to find a space of support, which will help me become even more responsible... Besides, I think it will be a different environment where I will have more autonomy to take my own decisions." Over the last 35 years, a lot of young people from SOS Children's Village Bogotá have learned to cut their own path. Many have learned their trade, several have found permanent employment, and others have started their own businesses.